Us is a gem—each facet meticulously cut and polished. With so much going on, it’s nearly impossible to think of the experience as other than the first viewing, and then all the rest. During the initial watch, the audience doesn’t know what’s going on, but during the subsequent viewings, they’re in on it. In this review, I’ll keep to the broad strokes and keep away from spoilers. The people living underground are called tethereds, clones of people on the surface who never leave the confines of the labs and living quarters hidden in abandoned tunnels and mines. In Us, it’s “as above so below,” and the folks underground use their cramped quarters to pantomime those they’re tethered to. It’s a government experiment failed, because the original person and their doppelgänger share control of a central “soul”, which the people on the surface dominate. Those who live in the real world enjoy education, free will, healthcare, socialisation, leisure time and activities, and much else, while the people below must go without all but the barest of necessities. Austere conditions have forced the tethered to take drastic actions, and those who have fled are who the story revolves around. But that’s only the half of it, because we’re them. And as the musical refrain from the film, “I Got 5 on It”, so aptly illustrates, five dollars doubled is needed to make a whole blunt (or what was needed when the song came out). Peele does a great job creating suspense, and then sustaining it while using objects of our everyday life to create terror. And even when the plot has run its course and the “good guys” “win”, the viewer is left with an uncanny feeling that there is much left unsaid. Us plays off the growing American fear that those coming for retribution are not alien, but us. If I mapped every thread of plot and subplot in the film, illustrated what the twist ending meant or broke down each scene then connected all the dots, this column of text would go on and on. And what I’m not willing to do is assume you, dear reader, are stupid. Instead, I’ll assume as Jordan Peele did. Each and every one of you have the ability to glean the truth. But, for those who just want to watch a horror film, Us can be viewed as such and it’s still a great film. 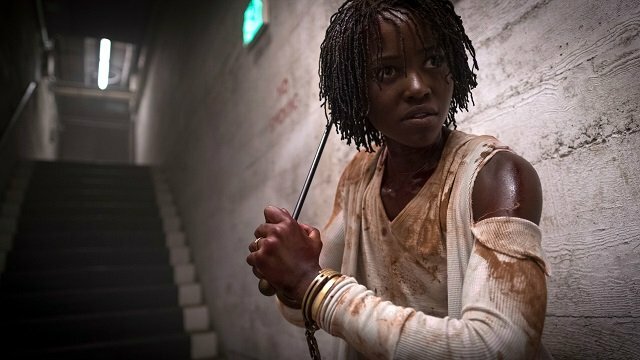 The most significant part of Us doesn’t happen in the movie; it’s Jordan Peele’s name rising to join the company of Lars von Trier, Panos Cosmatos and Gaspar Noé.